Korean food is one of the hardest food to catch depending on what area you are in. Now while I do have some problem with Korean tourists (but some are actually nice but it's hard to run into one)... I would like to talk about my adventures with Korean food. This is me also inviting Koreans to try out some delicious Filipino food in these places. Topoki is made from sticky rice, formed into dough and it's usually cooked into foods. It has the chewy texture that is added into some dishes. I enjoy topoki the most when it's cooked with spicy food. Another of my favorite Korean foods is Kimchee which is pickled Napa cabbage or Chinese cabbage. It is an appetizer that is for spicy food lovers. Another one worthy trying is the Korean beef soup of different varieties. They usually have a milky white broth which is usually made from beef soup stock. In my case, I usually enjoy this as a unique beef soup. Then again I also love other beef soups like Chinese beef noodles, Filipino style beef and other styles of beef soup... then again it's just based on my mood. 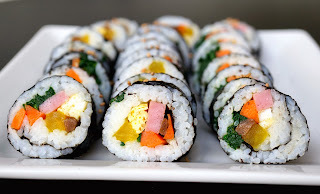 I love sushi, no questions asked but Korean Kimbap for me tastes better. Kimbap itself usually has more flavor than the Japanese sushi... and being a person who loves intense flavors, I usually prefer Kimbap over sushi. 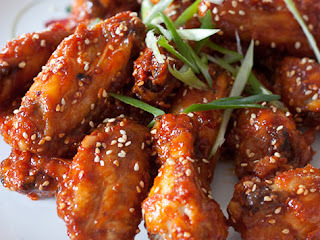 It can be nice to have Filipino style fried chicken cooked in garlic, Chinese style fried chicken, American style but you should also try Korean style fried chicken. It has its own unique taste as well. So what's your favorite Korean food? Just comment!